Ever since your cat had a little mishap on your bed, your mattress emits a strong smell of cat urine? This is a recurring odour problem for cat owners. SOS Odours has developed an effective odour neutralizer, easy to use and safe that completely eliminates this type of odour. URI-CLEAN contains an odour-neutralizing technology that effectively removes the smell of cat urine, even if it has been present for a long time. Even after cleaning the cat urine left on the mattress surface, the smell is not completely neutralized, since this is only the first of two steps. As it is alcohol-based, URI-CLEAN does not create an environment conducive to the development of mold, and it dries quickly, unlike water-based enzymatic products. It is not a mattress deodorant product, but an effective odour neutralizer for cat pee smell. To get rid of a cat urine smell on your mattress, simply follow the steps below, or watch the video. 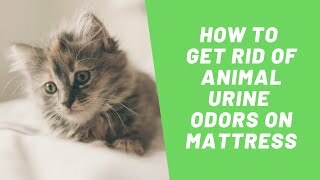 How to Neutralize Cat Urine Odour on a Mattress? Make a circle around the affected area (using string or similar), making sure the circle is 10-12 cm (4-5 inches) larger than the affected area because the urine may extend beyond the visible area. Inject URI-CLEAN with a syringe and needle while applying downward pressure from the exterior of the circle and working inwards, leaving a space of 2.5 cm between each injection all the way to the centre. The idea is to completely encircle the urine. Inject 5-10 cc of URI-CLEAN from the syringe with each injection. Finally, lightly spray URI-CLEAN onto the affected area of the mattress and leave to dry for 2 days. If you are treating multiple areas of the mattress with URI-CLEAN, ensure the room is properly ventilated because URI-CLEAN is an odor neutralizer, not a deodorizer. The product’s scent may remain in the room for a few days.